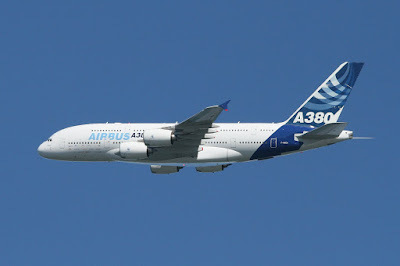 An Airbus A380 (MSN 009) is in town for a "fitting" at SFO as part of a "function and reliability" flight tour. 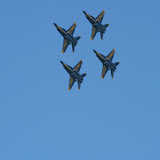 It's in town for several days, and did a few passes in today's airshow. I managed to capture a few shots as it was setting up for it's first pass. Unfortunately, nothing to provide scale, but it's definitely big and seemed relatively quiet (at least at low speed). Of course, the interesting questions will be how it performs in actual service, and if it ever becomes commercially viable or becomes another Concorde.